Day 2 on the Emerald Isle was spent on a tour of the western side of Ireland. 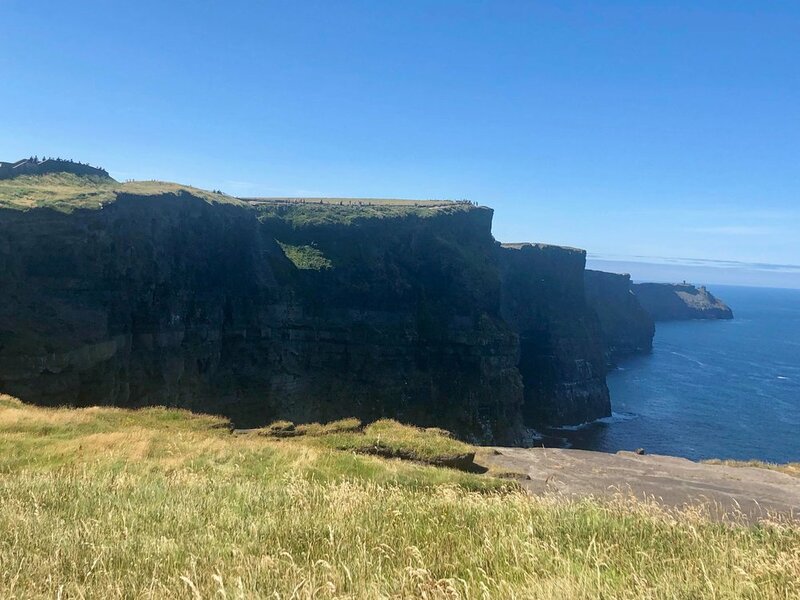 From Dublin to the Cliffs of Moher to Galway, the loop we made was a classic trek across the country, and took no more than 3.5 hours in either direction. Cliffs of Moher: a rather well-known destination in the west of the country. We went on one of the rare sunny days on the coast - as sometimes winds can get so strong as to knock people off their feet. The cliffs were pretty, though somewhat wanes in comparison with those seen along the coast of Great Ocean Road in Melbourne. The area has been thoroughly developed for tourists, and can get rather crowded during high season. 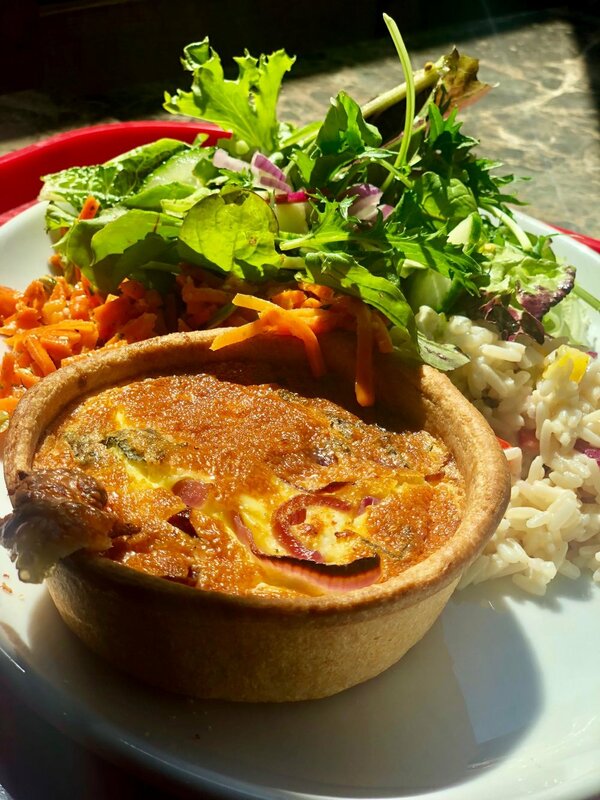 Lunch adn refreshments, such as the quiche I had below, is available in the visitor's center. Continue our drive north from the Cliffs, we stop by Burren, a famed vast expanse of rocky flatland in western Ireland. Neil Armstrong was one rumored to have visited the site and proclaimed the single spot that most resembled the surface of the moon, on Earth. Interesting, though I am not sure if captures the attention span for more than a 10-15 minute photo stop. Finally, onwards to the town of Galway, known to be prior to my visit only from Ed Sheeran's Galway Girl. And yes, he is Irish. Below is the main thoroughfare of the town, very much packed with tourists on this hot, sunny day. 'Buskers' are very commonly found on the pedestrians of Ireland. They are artists who perform on the streets, oftentimes collecting donations from any audience. Probably the most famous fish n' chips destination in the town - McDonagh's have been serving up batter fried fish since 1902. Come early to avoid the long lines that can build up in this family run operation. Fish and chips, as with Ireland's neighbor in the East, is an extremely popular food in the country. In true British, or Irish, fashion, people here eat their fried fish with vinegar (though I still do prefer tartar! sauce). Feeling adventurous, I opted for the fried plaice on the menu, having chosen it in place of the ray, which I was informed has many bones and may be somewhat hard to edify. I ordered the fried plaice for the novelty, when naturally the more plausible choice would have been the ubiquitous cod or white fish. It was good but...somewhat fishy. Quite fishy actually. And it still had bones in it. Still, never had a fried flat (excuse the unscientific adjective) fish before, I guess. Now for the sides! What IS it with European countries and curry sauce? Remember the currywurst in Berlin? Well here we go again...not that I'm complaining, since it was always good! Below left, chips with curry sauce, an apparent drunken favorite in Dublin as well. Right, mushy peas with vinegar. Try it without the vinegar and then sprinkle a couple of drops into the dollop of peas - it really brings out their flavor. Left, a regular, good old cod fish and chips combo courtesy of my more sensible friend. Batter was light and crisp, fries, sorry, chips, could've been slightly crunchier. Otherwise yum. Stop by King's Head for a pint (or two) of Guinness and a plate of freshly shucked oysters. The Church was a bar, restaurant, and potential nightclub (?) located in the heart of Dublin, also known as Dublin 1. Zip-codes aren't frequently used in the city, and Dubliners frequently used Dublin 1, 2, 3, 4 etc to refer to different areas. Inside this renovated ancient church, there's a full service bar, DJ, all the digs one needs for a night of impropriety, I suppose. What else would you order but a few more pints of Guinness, really? Except, maybe a few fingers of Irish whiskey...? This gentleman poured us both...and the night turned into a blur. See crowds below, getting rowdier and rowdier by the minute. Performers, revelers, and tourists mix merrily as the light fades, and along with the crowd's inhibitions. Finally, a staple part of any good night out: drunk food. In Dublin, the reigning institution for such guilty delights is Zaytoon - serving up 'Persian- Iranian' fare to local and foreign patrons late into the night. Left, Kubideh donner- minced beef and lamb delicately spiced and grilled on a skewer with pickled cabbage and all the works. Yum. Right, fish kebab donner- fresh salmon marinated with our own special spices and grilled on a skewer, with grilled peppers, shredded lettuce, sauce, and chips. Left, one of Zaytoon's specialty items, along with the grilled chicken kebabs: Barg - fillet of beef marinated with saffron and special spices. Northern Ireland was a region long torn by strife and yet stunningly abundant in natural scenery. Starting the day with a two hour drive to Belfast, we then drove all the way up to the northernmost point of the Isle, and back to Dublin again in the same day. Belfast - murals of the conflict that tore the city apart. It continues, though to a much lesser degree, even to today, as the Irish Catholics want an Ireland fully independent from the UK, and the predominantly Protestant population of region consider themselves to be British. The best way to get a comprehensive tour of the city and learn about its violent past is to take a Black Cab tour. Drivers are often Irish Catholics, though there are some Protestants who are now also tour guides, and will drive you around the city whilst telling you about its rich and conflicted history. Bottom left, an example of a wall that was built to separate the Catholic and Irish communities. If you look closely, there are three different tiers to the wall, indicative of the different times that they were built and added on to. Did you know the Titanic was built here? (I didn't...) Although much of the wreckage found is (for whatever reason) housed today at a museum in Las Vegas, of all places, there is a museum in Belfast dedicated to the tragic ship.